Lt. Cmdr. Leland “Chip” Shanle is answering questions about life as a test pilot and what it’s like to crash a 727. // Photo – imgur. Lt. Cmdr. Leland “Chip” Shanle made a career as a Navy test pilot, but in his civilian life he had the awesome opportunity to safely crash a 727 for science. 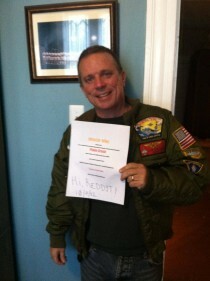 Now, he’s on social news site Reddit doing an AMA (ask me anything) and answering anything you want to know about the life and times of an aviator who has had some pretty unique experiences. He talks about crashing a 727, combat missions, fighter jets and more. He’s doing the Q&A because a show about a project where a 727 was remotely piloted and crashed for safety research purposes premiers this week.